Loydence Academy offers a challenging, high quality educational programme to students, within a diverse, multicultural community. We welcome students from many backgrounds and prepare them for successful transitions to secondary schools either in Qatar or around the world. We believe we can provide your child with an excellent, authentic British education. Primary school education is essential in preparing children for their adult life. We work very hard to ensure that each and every child is given the nurturing environment they need in order to fulfill their potential. We embrace the varying cultures of our pupils and use this to our advantage as children can meet, work with and become friends with children from all over the world. At Loydence Academy, we strive to create a community and family atmosphere; and stress the importance that every child matters. We are very proud of Loydence Academy and our pupils, and would welcome the opportunity to show you around. If you would like a guided tour of our school, please make an appointment at our office. We nurture and develop children’s love of learning through an inclusive, innovative and creative school environment. Our ethos of mutual ..
Our mission is to provide all our students with an excellent, innovative and balanced education for the life-long benefit of each student, their ..
We will – Provide a centre for educational activities that will result in high quality education in a caring and stimulating learning environment .. Registered in the United Kingdom and Qatar, Loydence Group is one of the Middle East’s fastest growing multi-holding group. With an outstanding ..
Children commencing school bring with them a good deal of knowledge and understanding about the world in their immediate vicinity. It is our aim to build on these experiences to provide a solid foundation for future educational development. 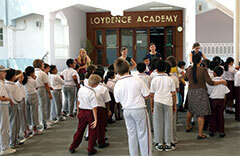 Child-centered and ‘hands-on’ tasks form key roles in the child’s learning experience at Loydence Academy.